Creating a Safe Handling program begins with a conversation to better understand your organization’s overall safety culture. The culture of an organization plays a key part in any initiative. If you are looking to improve workplace health and safety at your organization, it’s very important to understand the state of your current workplace culture. 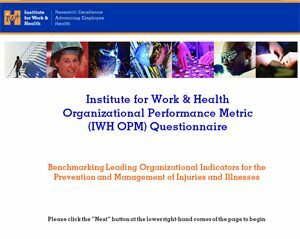 The Institute for Work & Health has a tool that will help you obtain a benchmark of your organization’s workplace safety culture. You can then use this survey to monitor perceived changes in your workplace’s safety culture as you implement changes. Make sure to capture a wide cross-section of staff when you survey for a more accurate picture. 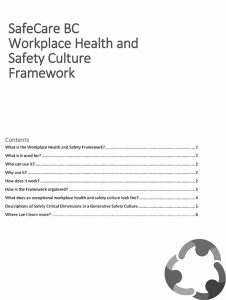 Once you’ve completed the Institute for Work & Health’s survey, you can use SafeCare BC’s Workplace Health and Safety Culture Framework to help you and your colleagues reflect on the state of your organization’s safety culture. To help with the assessment process, it is also necessary to identify factors in the workplace that may increase the risk of musculoskeletal injuries (MSIs) for workers. This process involves identifying those factors that present a possible hazard for injury, and prioritizing which of these require further assessment, and then developing control measures to reduce the risk of injury. 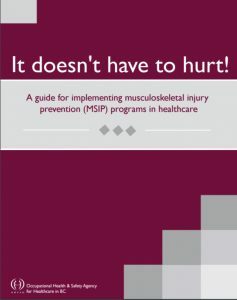 Parts 4 and 5 of the It Doesn’t Have to Hurt Guide, created by the Occupational Health & Safety Agency for Healthcare in BC, provides guidelines for identifying the risk of MSIs and helping to determine what control measures should be implemented.